Sunlight, rain and snow can quickly weather a boat’s vinyl and fiberglass gel clear coat, leading to premature aging and deterioration. Alumadock commercial roofing systems are designed to provide covered protection from precipitation and damaging UV light, there by significantly extending the life of your vessels, dock and decking surface. Alumadock uses the same materials in our commercial roofing systems as our X9 residential system, but combined with heavier construction methods and different specifications. 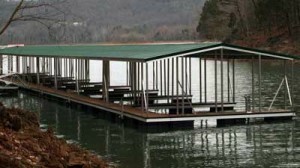 This allows us to fully customize a dock project to create a novel and custom design while meeting stringent local regulations and achieving the desired appearance. Get the dock you want, tailored to fit in perfectly. 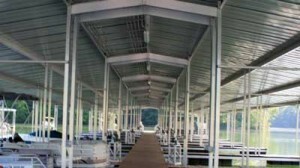 Alumadock uses 26ga commercial purlin bearing R panels, with galvalume substrate and 80,000 psi minimum tensile strength. Each panel comes standard with a lifetime paint warranty and 20 year substrate warranty, for ultimate protection. These features make the PBR panel an excellent choice for projects that require commercial grade performance. 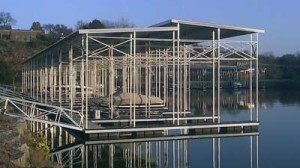 The panel is designed to maximize the strength of the dock structure, and with its added purlin bearing rib, you can count on easier installation and a more pleasing appearance. Rated for slopes as low as 1/2:12 and available in 19 different colors. We can match your existing design or propose a new one, made with our structural aluminum extrusions. The 6061-T6 aluminum alloy allows us to create a super strong yet lightweight roof frame with excellent weld-ability, lending to a superior roof system vs galvanized systems. 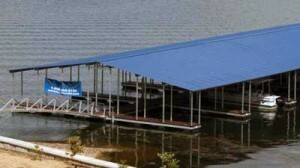 Just as the X9 dock components are used on our commercial dock systems, Alumadock’s commercial roofing systems feature all X9 components. 4×4 octagonal tubing posts are heavy enough to eliminate any low hanging cross bracing, creating more open and usable space in the same dock footprint. When eaves reach certain heights, bracing is added well above any navigable spaces, maintaining the strength of the roof while allowing for large ceiling heights. Structural pockets are slide into place and welded, in both dock and roof frame, for ultimate reliability and longevity of the roof system. 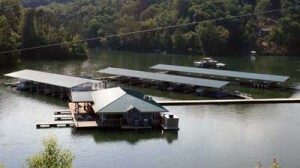 Our commercial docks have been designed to minimize the long term costs of owning and operating a larger dock, by reducing maintenance and creating long lasting commercial roofing systems.